It is hard to comprehend all that is going on here. You do gain a bit of understanding as to why there were almost always 2 or 3 nurses working with Beej. The perspective gained allows you to see what most never could. He lived to share the gospel of Jesus Christ. His desire was to see and know that as many as possible had the opportunity to come to know Him. He spent his time trying to win others to Jesus. He was not ashamed of the gospel. He shared openly at peril to his own reputation, and cared little about what others thought of him for it. What was important to him was bringing honor and glory to his Savior, Jesus. How he spent the last six weeks of his life is only of interest because of how he spent his life before it. He had an undying hunger to know the things of God. He would seek discussion openly and learned a great deal as a result. He was not afraid to ask questions. He had many mentors, and frequently asked deep questions of them. If his beliefs did not conform to what Scripture said, he changed his beliefs. He thirsted as we all do spiritually, but he knew where to go to have his thirst slaked. He brought routine encouragement to those who did not have it. He held accountable those who would otherwise struggle. He was not judgmental with his friends. He understood love and he lived it. He sought to share it so others could live it. He was exhilarated when others came to Christ. On multiple occasions he would run down the hall calling out to us when he had led someone to Christ on the phone or internet. You will see one such conversation in it's entirety, in the book. He loved and was protective of his sisters. He was very proud of who they were. He watched and learned from their example. He spoke highly of them to others. They inspired him in music. They inspired him in his walk. He inspired them in their walk. He inspired many by his walk. Others wanted the One he knew. Others wanted what he had because of how he lived. There was recognition of the need to deny self, and lay down the small things, so that one day he would be in a position for God to use him in a much greater way. He was obedient. He knew he was called to lay down his life, and he was not afraid. He gave himself willingly because he knew that in death his life would bring glory to God. He did not know how or when that time would come, only that he was called to it. He was eager to be obedient, even in this. He has forever inspired my life. A tremendous part of who I am is because of my son. That is very humbling. I write this today as I will be in San Antonio tomorrow and for the next few days. The Lord has called and my family has agreed that I need to go. I will be speaking five times at a high school youth retreat for San Antonio Christian Schools (500 students) on 9/26 - 9/28. Whitney arrives in Tulsa on Thursday to be with Deanna and Lauren. I return Friday night, then leave Saturday (the 29th) afternoon to preach a revival in Nowata, Oklahoma through Wednesday night (Oct 3). Then I leave Saturday for St. Louis, to speak Sunday pm at Maplewood Baptist Church (Oct 7). We will be together as a family for Saturday and Sunday in Nowata. There are other opportunities coming up, but this is the most intense period, and the Lord has designed it this way on purpose. Amid these things, our final draft of the manuscript is due. During the anniversary and birthday, God would have us to focus on Him. This would be pleasing to Beej. He would be the first to say, "Go!" Thank you for remembering with us! I ask you to pray for the hearers in each of these places. 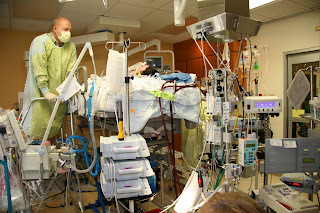 His bed is 6 feet in the air on a motorcycle lift to assist with the blood flow from his body down to the re-oxygenation chamber of the ECMO circuit. I am standing on a metal staircase. We were afforded the privilege of having two of the young men from our Peru team this summer spend Saturday night at our home. They are the age he would be. Many others came to visit with us. Our home was filled with laughter as they got caught up with each other, and wrestled on the floor. The sounds and moments delighted us. A crazy thing happened amidst all of it. Very early Sunday morning, Deanna awoke and could not go back to sleep. Unbeknownst to me, she decided to get up and go to a 24 hour grocery. All I remembered was she was up in what seemed like the middle of the night. Not long after that, I was startled awake by my cell phone ringing. The problem was, it was ringing in the living room, next to where our two visitors slept. I jumped from bed and raced down the hall. Grabbed my phone, and of course, it said I had a "missed call." As I wiped the sleep from my eyes trying to figure out who had the audacity to call me at this hour, I began to hear knocking...loud knocking. I did a 360 degree turn where I stood (ballerinas would have been proud of my pirouette). Where was this coming from? I raced back down the hall toward my room...all the doors were ajar...no reason to knock. Then I thought maybe the guys somehow got locked into the room they were sleeping in, so I raced back down the hall the other direction. Their door was slightly cracked open. More knocking...impatient in intensity this time. Half asleep and fully agitated, I did another 360. What in the world was going on? I raced back down the hall to Lauren's room. Her door was not latched, but I opened it anyway to hear her say, "What is that knocking?" "I don't know, I can't find where it is coming from!" Then I heard it again! My mind is racing, but I am clueless. Then again...this time it sounds like it is coming from my room?! I enter the room and shoot glances to the open closet door and bathroom doors. I rush over to the window, somehow thinking that if I get there quickly the incessant noise will cease. I pull open the blind, and there stands my beloved. I cannot hear a word she is saying, but she is showing me a key with very large and animated gestures (in typical Deanna fashion). She is trying hard to tell me something...I think I have it figured out. Unknowingly, she has been chasing me all over the house in the wee hours of the morning. She could not have known my cell phone was in a different area of the house. She came to where she thought I was and began to knock (and drive me insane...I know, not a far trip). I hurry to the front door and let her in. She begins to tell me the story. She could not sleep so decided to be productive and go grocery shopping. She grabbed the key she thought was for the car parked farthest back (all were blocked in, except for Lauren's), which did not have a garage door opener in it, and headed out. She hit the button to close the garage door and ran to beat it. Once outside, she realized she had the wrong key...and no house key! She could not re-enter the house without waking me up. So, she tried...and tried. She could not figure out what was taking me so long to come to the window. She knows I don't sleep that soundly. She had no way of knowing I was running from one end of the house to the other trying to figure out what was happening. Praise God that He makes His ways known to us!!! The other day I was doing laundry. I have done laundry since I was a junior in high school. Some people hate to do it. I'm not sure why. I don't mind it so much. In our marriage, it has always been my one of my tasks. I'm sure I've written about it before, since I remember talking about BJ forgetting to empty his pockets and how frustrating that was at times. He would leave pens in his pants which would ruin our clothes. (I know, I know, I should have checked...I didn't say I was good at this, just that I have done it forever). Anyway, we haven't had any ruined clothes in, well about two years now. Everyone has favorite clothes. Whenever I hear the words, "I can't find my three quarter length sleeved black stretchy shirt," I scurry off to the laundry room to see if I am behind. I know that is not intended to be an indictment of my laundry timing, but nonetheless, I also know that I need to get up and help join the search. It is better for me, if the loss is not my fault. Is that defensive? Probably, but I don't like being the unintentional source of frustration or annoyance (I work hard at being intentional about those things, so when it happens without my blessing, I get a bit...annoyed). Anyway, back to favorite clothes. I think it is amazing how full our clothes closets are and how often I see the same outfits in the mirror. Literally, they should be monogrammed, "Monday, Tuesday, Wednesday..."
I don't know what it is about certain clothes that cause them to get picked all of the time, but I think we need to be more gracious in our approach. No one likes being the last one picked for dodge ball. We need to be more sensitive to the less popular items in our drawers. Deanna has her favorite night shirt. It used to be bright pink with black and white letters on it. I think you know what it says. I have my favorite jeans. They used to be my least favorite. I have trouble with the new styles and how they seem to not cover as much as they used to. At least I blame it on the trends. That might not be the real issue. Anyway, they used to really bug me when I wore them. I discovered when I wear a belt, they behave a little better. Now I really like them. As I was folding clothes the other day, I was startled. A shirt I had not seen come through the wash in a long time was suddenly there. It's hard to describe the feeling it gave me. As it lay face down in the basket, there was a familiarity about it. When I picked it up, I immediately realized it should not be there. It wasn't the right size and didn't get worn anymore. It used to cycle through all of the time. It must have screamed "pick me, pick me," everytime the drawer was opened. Actually, many times it didn't get put away...it lay out in the open waiting to be 'put on,' again. As I turned it around to make sure it was what I thought it was, I experienced a mixture of bodily responses... from sweet relief to nausea. There was that small black t-shirt with the white print on it (see the picture). He wore it all of the time. Where had it been? How did it get into the basket? How precious in those moments it felt to once again be folding his laundry. There is another small black item that often lays out but doesn't always get the attention it deserves. It too can evoke similar responses from the body. For many of us, its primary role is as a "dust collector." It is waiting there. It often cries "pick me, pick me." Unfortunately, through time and experience in ignoring it, the cry grows fainter and fainter. 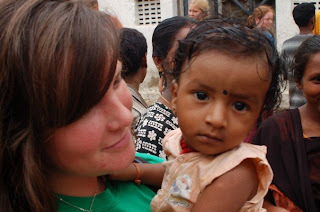 Lauren with a Hindu child in India. Yesterday morning we received our updated manuscript for final approval (from our publisher...Revell). While it was not actually in a bound book yet, the pages are all type set, the pictures added (there are many), and each page is reflected just as it will be, once bound. We are filled with such excitement and enthusiasm to see the project nearing release. We are so pleased with the work Revell has done, and see the Lord's hand in each step of the process. We truly believe that He has been giving the direction necessary to each step of this journey, and could not be more pleased with how things look. We cannot wait for you to see it! If you read yesterday's comments, you will see a prayer request for the community of Mooresville, Indiana. A student who by all accounts seemed well adjusted, took his own life. It appears that he was active not only in school, but in church. We do need to lift up his family and the community as they grieve and deal with this shocking event. Unfortunately, for many today, suicide is just one more option in life. While it is very hard for us to understand, we need simply know that Satan continues to prowl among us, seeking those he can devour. We need to be paying attention to each need we encounter, and doing what we can to intervene. This will not be the last event of this kind. We will mourn others. I cannot imagine the pain of a family who lose a loved one this way. Please join me in lifting them up. Also, one of Lauren's teammates from her India trip has been in the hospital for a couple of weeks in Oklahoma City. Doctors believe she contracted Chikungunya and West Nile Virus from mosquitoes while out of the country. Her name is Megan. She had been in tremendous pain. She was doing better, and then had an allergic reaction to something she was given. Please pray for her quick recovery and release. She has had to withdraw from her classes at Oklahoma University. Thank you for assembling and bombarding the Throne of Grace! Each land the Lord allows me to enter teems with children. They routinely express joy in ways that is not often seen from their parents or other adults. The little ones are very open and inquisitive. They do not assume a language barrier, and are not afraid to speak with you even if your command of their language is less than good. One of the things I have often said of my own family is true elsewhere. The "children are the wealth" of those who are raising them. Investing in their lives is extremely important to the foundation of who they will become as adults. Those who have parents who take time and are available to them are not without problems, but do seem to be well adjusted later in life. I know I have talked about children on many occasions. There is no judgment in their hearts. We teach them that later. They come up to me routinely, a white bald man, with questions and laughter. "Is it cold up on my head?" is one of the favorites. It is always asked with giggles from the pursuer and eruptions from like thinking friends with them. "Can I feel your head?" is another one frequently asked. I have never seen a more contagious invasion than when permission is granted to one, and then many spontaneously show up to do likewise. Their glee is equally viral. Having this audience comes with a responsibility. On some occasions, I would invite one of my students to then share Jesus with them. On others, I would do so. Still others, were the end of our time with them, and we just laughed together. Celebrating life with children who don't know you can be more intoxicating than many other things in this life. They love without condition. They share openly. They laugh frequently. They do not judge. They are inquisitive. They celebrate similarities. They like to learn. They are not afraid to speak the three words of English they know. Barriers that exist between many, fall hard and fast when children are allowed to participate. While their energy levels can be tiresome, their extensions of love and kindness are exhilarating. These are among the many reasons, I believe, Jesus tells us that we need to "have the faith of a child," or that we need to come before Him like a children. When we do this, we do so with an openness we will not experience otherwise. It is more desirable to interact with those who come with joy and lack judgment, than to be drug down the alley of decisive derision. Sometimes, letting someone touch your life just because they will, can open the door to opportunity, and even forge new foundations for friendship. Telling people about Jesus is one of the greatest privileges I can imagine. As I read about Paul's journey's and the difficulty he encountered, I am blessed by how focused he remains. He does not get distracted with details of suffering and imprisonment. He just spends his time telling those who will listen about his best friend...one he never knew personally, until he was overwhelmed by tremendous light on the road to Damascus. He was passionate about Christ! I am often moved by passion. People who are passionate stir something within me that I cannot describe. I don't always agree with what they are passionate about. I don't always agree with the direction of their passion. Yet, their passion awakens something within me. I have been passionate about a few things in my life. I can remember when my interest for a thing or a hobby was growing. I would speak about it to anyone who would listen. If you are passionate, there will always be an audience for what you have to say. People are moved by others who have a deep, abiding belief and understanding of what they are talking about. People want to be stirred. They are hungry for something to throw their energy behind. I am dumbfounded as I look back at some of the things I have been passionate about, because as I gained knowledge and would speak about the topic, people would listen, and some even joined in with me to enjoy the tangible aspects of whatever it was. I am embarrassed at how long it took me to become passionate about my Savior. I remember a trail of other interests that led up to the discovery that Jesus was truly the only passion that was worthy of my energy and effort. Each of my other interests lasted only a season. Three or four years, usually. Jesus promises and brings fulfillment in ways that no thing or event ever can. We can spend our lives planning for the next weekends activities. We can fill our calenders with things we enjoy doing. We can be so busy doing the things we love...and remain completely unfulfilled. This cycle continues. We plan more things of interest to continually try to fill that void. We anticipate them. We look forward to them and talk about them. Then the time comes and goes, finding our participation enjoyable, but completely empty of the expected finished product. We are trying to fill a Spiritual void with an intangible element of the world. It will never bring the expected pleasure over the long run. The solution is to stop chasing after what cannot possibly bring us fulfillment. That includes everything but Jesus. If your like me, it will take way too long before you come to understand this. Empty, unfulfilled Christians stand side by side in churches every weekend, hoping to find what they already have, but are not allowing to be all that God wants it to be. His place in their hearts is being suppressed by all of the other things that the world is offering. They may entertain for a season, but when the season passes, so does the pleasure. Christ alone is worthy of your passion! There are few things that bring us satisfaction and encouragement in life like hearing our own name being called. When others call it out, the ring of familiarity brings about the notion of being needed. Being needed is something we all desire. Sales people are trained to learn your name and use it frequently. This builds trust and helps you to feel at ease. Whether false or not, it tends to build your confidence that this person actually has your best interest at heart. Hearing your name being called by those you are closest to, rings of intimacy. Of course, the tone of voice used says much about the intended direction of why your name is being called. We learn quickly to be able to tell if we really want to answer the person or not. Still, our name is our name. Even if we share it with others, we can usually tell if we are being addressed or if someone else is, by the familiarity of the voice doing the calling. When someone new uses it, hope and the potential for friendship come to mind. Hearing your name coupled with your middle name usually implies trouble. Either you are already in it, or you are about to be. Having the word Mr., Mrs., or Ms. implies formality. Someone who does not know you, but is offering respect. The use of your nickname often tells you that you are close with the one speaking. It can even evoke memories in the instant it is being used. Transporting you to a time and place when things were "better," less "complicated." There can be situations where the use of your name implies a lack of respect. Consider the child who calls his parents by their first name. My children only ever did that when teasing. How it blesses my heart to hear my daughters call out "daddy," when they need me. I miss my sons voice. I miss the unusual derivations of "daddy" that he would come up with. Even then, his voice was full of love and laughter. Seeing your name in print usually is a good thing. It gives a sense of achievement, accomplishment, of recognition for a job well done. Most of us would like that. However, there are times we'd rather not hear or see our name. When our failures become public knowledge, seeing them in the paper for criminal offense, divorce, etc. do not bring warm fuzzy feelings. Somehow, we would prefer not to be recognized. Our hope moves to the desire that others are too busy to read. I am so thankful that my sins have been forgiven me, and that my Father in heaven does not recognize me for those things, but for the righteousness of Christ. I long to hear Him call my name. I am already close to Him, but to hear Him use my name will bring such a flood of indescribable feeling. He cares enough for me to call me by my name. Revealing His depth of desire and compassion for my heart in the use of one word. I cannot wait! In our world where things are often confused and backwards, I can't help but wonder how it makes Jesus feel, to hear his name spoken more frequently by those who do not know Him, than those who do. Use His name today to draw Him close, to worship, to just love on Him and let Him know how much you care! One of the last pictures taken of Deanna and Beej. 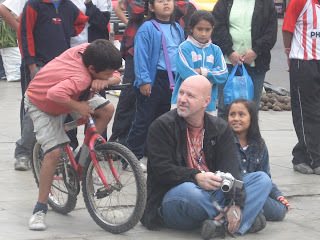 This is from a mission trip they took together with our church, just before BJ's last Peru trip. "We have all sinned and fall short of the glory of God," the book of Romans says. Flaws exist in each of our lives. Some that people see, and some that we keep hidden. I am no different. My son was no different. We both need His shed blood to cover our sin. Without it, we would not be saved. Without calling upon Him and asking Him to be our Savior and Lord, we would remain lost. It has been brought to my attention on a number of occasions that when I present my son, I make him seem perfect. He was not. He was argumentative when he shouldn't have been. He could be disrespectful in his decisions and actions. He got carried away in pursuing the things he enjoyed and allowed them to take first place in his life. He struggled with obedience as most children do. He would act on impulse (like Peter) and later pay a price for not thinking things through. He was very normal in these things. This is by no means an exhaustive list, but as I contemplate what I hear some people say from time to time, in reaction to the life he lived, he is seen as one who lived in a way that is not possible for us to live. This is just not true. He was an ordinary young man who served an extraordinary God. He allowed the Lord to have access to his life in ways many of us shield Him from. BJ was a sinner. He made mistakes. He also sought hard after the God who sought hard after him. When I read the Word and look at the lives of many of the people who we revere from the Bible, they had similar stories. They were sinful people. Many committed heinous acts, yet were considered to be men and women who had God's favor. Today, in the context of our culture, it would be hard to imagine having a king like David do the things he did, and still consider him to be saved, let alone a man after God's heart. We have become extremely judgmental. Somehow, we have distanced ourselves from being real. We hold ideals that are unfair, let alone attainable. When our Christian brothers and sisters who are in the limelight, fall, we are quick to condemn. This is not a biblical response. Each of us that have yielded to the Lordship, of Jesus Christ, are sinners saved by Grace. What we do with our lives after that point, is our opportunity to bless the heart of God. BJ blessed the heart of God, but he also continued to make mistakes. David pursued the heart of God, but he also made mistakes, (big ones, at times). It is unfair to hold those we esteem up as if they were perfect, and their lives impossible to live. If I have done this with BJ, then I have failed to communicate well. I know I am routinely blown away by the faithfulness I saw in his life. Is being sold out for Jesus such a foreign concept in our world today, that we consider ones who lives that way to be among a "chosen few?" All we who are believers serve the same God. We all can be Jesus Freaks if we are willing to remain surrendered. Too many of us allow fear to keep us from being radically changed. We want acceptance from community more than we want faithfulness to Jesus. We fear if we share, or are seen as sold out for Jesus, we will be rejected by those we want to embrace us. The reason BJ seems different is that he did not let fear stand in his way of being who he was in Christ. We all have access to that same life. The difference is, we choose to allow other things to be the main focus of our attention and simultaneously let the fear of losing the attention of others supersede who Christ has called us to be. We revere those we know are not perfect (who are believers) because of the lives they lead during times when that is hard to do. We cannot afford to then act as if they are the only ones who can live that way. We must do so, and we must teach our children to do so. Christ taught us to do so, and He lived a life of example for each of us. Here is the most recent picture taken of my family. This one is from Mother's Day of this year. That's Lauren, Deanna and Whitney across the front (L to R). I don't much like having family pictures taken. I never have. I've always thought of them as 'necessary evils' in life. When I was little, I despised getting my suit on and going to the studio, and fake smiling for endless shots from the guy holding a stuffed monkey in one hand and the clicker for the camera shutter in the other. I always thought that would be the worst job I could imagine. Forcing myself to try and be funny all day long. Of course, a stand up comedian, I am not. My sarcastic humor would have been lost on the endless run of children whose mommies brought them in to be captured in time. Having said that, I was kind of amazed at how funny some of these photographers were. At least the ones in the studio's. 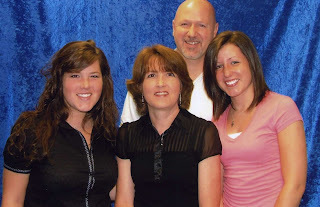 Somehow, when it came time to have the family pics taken for a church directory, the funny people were all on holiday. We seemed to get the guy with a bad comb over and a mechanical personality. It seemed like he had never been in church before and was afraid someone was going to try and save him. He was biding his time until he could leave. He was not funny. My view now is a bit different. Having pictures taken of the family, while not fun, is necessary. When I look at the last one taken of all five of us, I am unhappy that we never scheduled a more recent one. Fortunately we have plenty of snapshots on hand. I am always amazed at how impossible it is to please everyone when picking out pictures to use for public consumption. For this site, I have stopped asking permission, because somebody always hates the picture of them. I hear the line, "it's good of everyone but me," all the time. 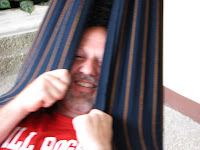 In fact, I seldom like the pictures of myself. Wouldn't it be cool if we could see ourselves as the Lord does? Each picture simply a reminder of a specific time or event. Not focusing on the expression or extra pounds or how the outfit worked, but just seeing the heart. Recognizing, "hey, that is my child, and I love him/her." that only seems to exist in our imaginations. I am continuously amazed that the Lord provided me with a wife who loves me without condition. I don't deserve it, and I often want so much more for her. She is an example of Jesus to me. She loves me and respects me, and she lets me know that. Its hard for me to imagine being able to function in this world without her. Of course, she will probably insist we go get another family picture taken next time Whitney is in town, but oh well. We can always make fun of the proofs together when they come in. 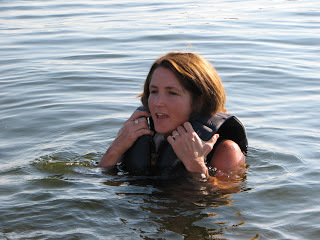 Recently, Deanna and I had the opportunity to go boating (and wake surfing) with some friends. This is my lovely bride before she surfed. Neither of us had ever wake surfed before. We had both been on water skis, but honestly, didn't even know what wake surfing was. Basically, you use a very short rope that pulls you no more than five to ten feet behind the boat on a surf board. When you get up, you can release the rope and the momentum of the wake being pulled behind the boat keeps you moving right along. One who is skilled can cut back and forth across the wake and remain in the pull of it's tide. One who is not skilled, hangs onto the rope for dear life and the look of terror is permanently etched on their face. Guess which one I personify?! Regardless of your answer, you give me too much credit. I got up on the surf board (so did Deanna), but I certainly got no points for style. I listened intently to the instructions being given me. I knew I had no chance of being able to do this, unless I had a clue what I needed to do. I took the information I was given, and successfully rose out of the wake and onto the water. I remember many years ago when I was learning to water ski. Once up, I would jump the wake repeatedly, getting as much air as I could. I absolutely loved the thrill of the moment! Like I said, "once up." Getting from down in the water while fastened to a couple of planks and trying to keep them balanced before the boat took off, was hard work until I got the hang of it. The next step was the one that nearly kept me from ever getting up. When you are being pulled behind a speed boat, strapped to pieces of wood that want to head off in opposite directions it places you in a very vulnerable position! Meanwhile the the force from the pull of the boat, drags you under water where the overwhelming desire is to let go before the incoming water enters every orifice and inflates you like a 'raisin' returning to 'grape,' status. Overcoming the urge to let go, with the knowledge that if you can just hang on for a moment or two longer, you will be up and gliding like a figure skater, was difficult for me. In those moments before being "upped," I was sure I was about to die. 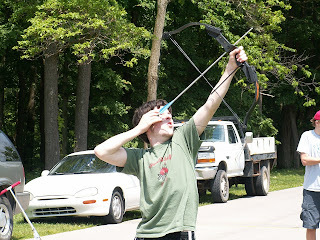 I was filled with terror and exhilaration at the same time. I find my life to be like this right now. When God is doing a new work in you, it can be one of the most uncomfortable things imaginable! You are stuck between joy and terror, fear and amazement, even faith and unbelief. You know that if you can hang on and be faithful, He will pull you up and show you new and incredible things. In the moments before that happens, it can feel like your life is being withdrawn from you, and there is little hope. This is primarily because we tend to look at these events through the lens our own experience and ability. These moments are not about our own experiences. They are about our obedience and trust. Having the faith to believe that He will deliver. When Peter was walking on water, the sudden realization of where he was nearly cost him his life (or so he thought). He quit looking at Christ, and began interpreting his circumstances based on his abilities. At that moment, he plunged. We cannot look to our own abilities when God is looking to draw us into new experiences. We must endure the desert, trudge through what looks like certain peril, and then soar aloft on the wings of eagles! He will deliver, if we remain obedient. We must look to Him for the steps we must take. If we are scanning our memory banks for the answers to the questions ahead, we will not find what we need, save the one where we have a surrendered heart of obedience. 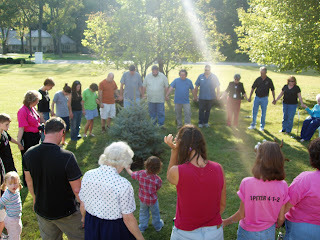 Perhaps some remember the story of planting the tree which would commemorate BJ and his birthday, on October 1, 2005. As we circled up to pray, the presence of God uniquely joined in with us. Yesterday, we received a catalogue in the mail. The catalogue contained each of the books coming out around the same time ours does (January) from our publisher. It is very exciting to see a full page add of our work. A search yesterday on the internet revealed that christianbooks.com has now added the book to it's page. It can be pre-ordered there for $7.99. It is also available at present, from revellbooks.com, walmart.com and amazon.com. I know others have pre-ordered it from Barnes and Noble while in the store; however it is not on their web site. The catalogue I referred to will be distributed shortly, so hopefully it will show up on more Christian web sites, soon. This past Sunday, we shared our journey at a church here in the Tulsa area. They were a precious congregation, and were so friendly and receptive. The Lord moved among us during our time there, and we continue to be in awe of Him. I spoke with a pastor from Michigan recently, who called our offices to order the dvd of BJ's Memorial Service. He had recently become aware of it through one of his church members who showed him the cd jacket from MercyMe. He listened to the song, and was moved. He preaches his last message on Sunday (as a pastor) as he and his wife are moving into missions. It was so refreshing to hear his heart. They are going to work with a large Muslim population. How inspiring it is to see the obedience of others. Today commemorates the 6th year anniversary of the tragedy of terrorism which hit our country hard. On a day such as this, let us be mindful of the need to continue to share Christ with those we come in contact with. We never know how long we have, and we certainly want others to be ready when their time comes. We may be their only opportunity to hear the gospel. It is a good time to pause and ask the question, what are you willing to die for? Six months to the day after 9/11, I stood at a window, high in a building I was not supposed to be in and looked into the depths of the earth as workers continued recovering body parts at ground zero. They took such care with each find. I was moved in a way that is hard to describe at how the men who were on a recovery mission, were so very careful. Though it was not possible to identify remains at that point, had it been a family member of mine, my appreciation level for the reverence they demonstrated could not have been higher. In many respects, they were emulating Christ and the way He treated people everyday. It should compel us to treat one another similarly. Unfortunately, it is far easier to react from the flesh, and lash out or talk behind another's back. We can each do more to be an encouragement to others while they are with us. Attempts at doing this rather than waiting to treat them with respect after they pass, will enrich their lives and ours. It is a small thing, but it would have a significant impact. Encouragement is needed by each one of us. Respect is as well. What do we gain by depriving one another of such things? Nothing. Today, lets give it. Guayaquil, Ecuador. These photos were taken two years apart at the same hotel. One of us didn't have quite enough material to pull across our body. The attitude we present to the Lord when serving Him is very important. Not only does He already know our hearts, but those around us can read our faces, our body language, our disposition. If we are to be Christlike in our lives, that clearly includes our demeanor in approaching each task before us. The above photos were taken at the nicest hotel we stayed in this past summer. While I did not want to rob my team of the pleasures it had to offer, I did not want to set the precedent of staying in this hotel at the beginning of our journey. They were very focused on ministry, and anxious to get at it. We flew into and out of Guayaquil, Ecuador, en route to Peru, as it was considerably cheaper than flying into and out of Lima. This hotel had the potential to plant a seed in each mind that we were going on vacation, and were staying in really nice places. For that reason, I chose to reserve our time there until the very end of the trip. A sort of reward for a summer well spent. The places we stayed in Peru were certainly adequate. It is my desire to live in the countries we serve in, as closely to the way the locals live as possible, while still being safe. This usually found us in places that spilled onto the streets where much traffic of people and business were taking place. There were times that some of our team were literally sleeping on cheap box springs that had been mistaken for mattresses by some of the hotel owners. I never heard a single word of complaint from them. Their expectations from this experience, did not include living in luxury. While I would not call a simple mattress, luxury, at the end of a very long and tiring day, wooden slats instead of pillowy comfort could cause frustration, even weariness. I never heard a disparaging word. The team embraced each thing that happened as part of their experience. They knew the Bible said that as believers we will suffer. They were prepared. When a 6 to 8 inch rock crashed into our bus, 3 inches below a window, their attitude was to pray for the hurler. He was not mad at us, but at the ideas our country represented that he did not have access to. Though the Word says as Christians we will suffer, and to count it gain when we do; I am amazed at how often we suffer more at the hands of fellow believers, than unbelievers. What is our attitude to be when we serve? When the end our of our journey in Peru had come, and we retreated to the hotel pictured above, I met a fellow believer. She was in charge of another US based mission team. She asked about our journey. As I told her what we had been up to, and how many lives the Lord had claimed for His kingdom, I also made a reference to this nice hotel. I spoke briefly of how it was by far the nicest we had inhabited all summer. Her reaction? She began to tell me a story of how their youth pastor was supposed to lead this trip, but had resigned. The leadership had fallen to her. She did not seem pleased. She said, "I made an advance trip here to find a place like this to stay, because I don't rough it!" Clearly, we are each allowed to have our own opinions about how and where we live. I have no quarrel with that. However, when the reality of those feelings are superimposed onto a group and do not stop at the conditions of the hotel, but are transferred into nearly everything the group does, the result has a major impact on the ability of that team to have impact. This lady had little to no joy. I did not sense much joy from the others on her team, either. I don't think I would enjoy sitting through their description of their trip back at church. This same lack of joy in serving, is likely to be what others sense when stories are told. Was she just having a bad day? Perhaps. Should I cut her some slack? Probably. As Americans we face significant judgment and scrutiny from others, nearly everywhere outside of our own borders. If our attitude is not Christlike, that is what people will remember. Our general attitudes of entitlement have been experienced by people in other cultures and they do not understand it. We should not be accepting of those attitudes. As believers, we need to be aware that the only thing we are entitled to is eternal separation from God. Yet because of His grace and mercy, we don't receive that. We get a reward we don't deserve, and while it comes at the end of the journey, it is eternal. Lets convey that attitude to others. For some reason when I post, all of the paragraph breaks are being deleted. I apologize for how hard this makes it to read. 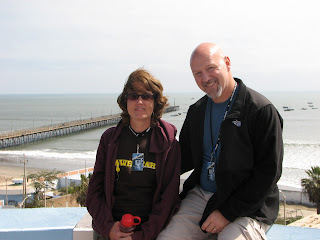 Deanna and I are sitting on the same wall overlooking the Pacific in Pacasmayo, Peru, where the picture of BJ (being used for the book cover) was taken. Our good friend Barbara Ann (who was on BJ's last team) served in leadership with us this summer. She took this photo, and then later told us that this was the same spot BJ sat for that photo. We had no idea at the time. I am finding this month much more difficult to deal with than I expected. Emotions are once again very close to the surface, and holding them at bay is difficult. My intent is not to whine for sympathy on any level. I am hoping that being truthful will somehow help me with focus. In the wake of his passing I could not focus on anything. I find myself in this place again. The Lord has directed me to preach at an upcoming Christian School Retreat followed immediately by a church revival (11 messages in 12 days). I will be away from my family quite a bit over the anniversary of Beej's death and birthday. I do struggle with this. I am a man. I am supposed to be able to handle this. Right now, I feel more like a child who wants his daddy to come and pick him up to hold him. I know that I have always been more emotional than most, and do not apologize for this. It is part of who I am. This is part of the reason that I have always been captured by the passage in Revelation 3:21 that says, "to him who overcomes I will give the right to sit with me on my throne." I have found comfort many times in the visual of my heavenly Father loving me so much that He invites me into his lap while He reigns. The strength and security of this picture brings almost a tangible hug from God. Father's who invite their children to their laps do so, to love on them. They are brought into such intimacy in those moments, and they are never forgotten. I can remember sitting in my father's lap while he read to me. It was such a secure and powerful feeling. I remember many times where my own children sat in my lap while I read to them, or I just held them. I still do this from time to time, when they are willing. Sometimes, they even invite themselves. I am glad they feel free to do so. The father who opens his lap to his children invites much more than a moment of closeness. He invokes a lifetime of security and even broader understanding of the Word. Thank you dad, thank you Father God! Investing in the lives of those who look up to you will have a deep and abiding impact. Time spent with them can make all of the difference. BJ was one who enjoyed being involved in the lives of others, no matter what the age. Here he is pictured with his younger cousins, Joshua and Emily (and our dog Dakota). They so seldom were afforded the opportunity to spend significant amounts of time together, but when they were, they took full advantage. Memories like these do not fade quickly. They draw us closer even when the miles won't allow the physical touch or contact that we each desire. Looking into the lives of nieces and nephews through the lens of "uncle," is not always accurate. Still, knowing that they are naming pets after their fallen loved one, and drawing pictures which include him at play with them, speaks volumes about the kind of impact he was able to have. They know what he stood for. They know that he loved them enough to play the games they wanted to play when they were together. In our world where selfishness has become the entree' and others needs are always relegated to the 'a la carte' side of the menu, finding out what others desire and spending the time to fulfill them is no small thing. There is so much truth in the pictures children draw. They innocently draw what they see. The brutality of their honesty is never intentional. That is measured by each of us, who do not appreciate the truth of our own lives being captured by pencil, crayola or ink. The relative who always has a phone attached to their ear is not one who is measured as one who is available. The father who is absent in his child's picture needs to take notice...his children have. The mother who reads to her children from an early age, and does not stop just because they too can comprehend words on a page, will do much to nurture creativity, curiosity, and foster learning into their young lives. Time is the asset we all share the same amount of. What we choose to do with it is often up to us. How we choose to invest it is something we can control. We need to choose to spend it on those we love. If we don't, we are showing them what is truly important, and it isn't them. You cannot substitute quality for quantity. There are seasons when you are forced to do this, but in the long haul version of your journey having time to be lazy together with no agenda is just as important as a full slate of activities, visited like a bee frequenting flowers. Not everyone will agree with this. However, when my own children (now adults) reflect back on when they were little, what they talk about often centers around favorite memories. These often include watching "Winnie the Pooh" or other leisure events that brought meaning, not because of the quality of the show, but because of the intimacy experienced in viewing it together. No matter what else you do or don't have, you do have time. Spend it on them. They need you to whether they act like it or not. Some months ago I wrote about Lucile. She was 98 at that point. Amazing! Still driving, still volunteering at the local hospital and very involved in our lives. She was co-founder of Awe Star Ministries almost 15 years ago. Since then she turned 99 and continued with a zest for life few ever experience. It was Lucile that went to the store for BJ, his first year on the mission field, to buy him an item of two he had forgotten to pack. "This is my joy," she would say. She loved to serve and to be involved in the lives of students. In 14 years with at Awe Star, she only missed one summer of being present at training. That summer she was having a hip replacement...at the age of 97. She was annoyed that it slowed her down for a time. It was Lucile who was instrumental in our coming on staff at Awe Star. She paid our moving expenses. She brought huge encouragement every time we saw her. She was so glad to have us with the ministry and spoke such kind words each opportunity she had. A former music teacher herself, she prayed and worked tirelessly to try and assist Deanna in finding a music position. When the Lord opened the door in Sapulpa, she rejoiced with us, but labored over the drive she had each day. She began to pray for an opening in Jenks. It was close by, and would be a better situation. That came about this last month. Deanna began her new position and loves it! Simultaneously, Lauren's future became Lucile's project. When she found out that Lauren had applied at a particular ministry, she called that ministry to tell them to hire her. It turns out, Lucile sat on their board! Lucile's instructions to them were very clear. That situation is still being sorted out. Back in early June, after a series of mini strokes, Lucile headed to the doctor for a check-up. She was told to sit on a rolling stool so they could provide treatment. That stool tipped over, dumping her small form onto the floor, breaking a couple of vertebrae in her upper back. Since that time, she has been in hospitals trying to recover. She has battled infection after infection. She grew extremely weary as the roller coaster of recovery seemed never ending. She was miserable. A week or so ago, the doctor told her she the infection was back, and that her body was not assimilating the drug she needed to combat it. He told her she was dying. Armed with this knowledge, and ready to meet her Savior, she began to give instructions of what she wanted done. 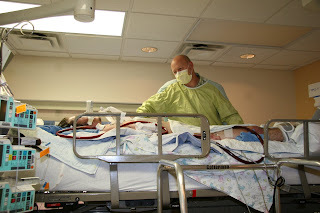 Her body continued to battle incredibly. Her heart raced for days, without a corresponding drop in blood pressure. The doctor said he could not understand how she was able to continue on. He had never seen the body of one twenty years younger fight on the way she was, let alone one almost 100. At times she had a high fever, due to the infection which should have brought with is significant pain. Lucile had no pain, she was at peace and ready to go. She battled through nearly a century of life and saw more than I can imagine. She was always the encourager. Active at the age of 99 in many organizations, sitting on several boards, and assuring that students continue to go to the mission field, she sought the Savior and her life counted. She made a difference in our world. She is responsible for seeing thousands of students go overseas to share the love of Christ. Sunday morning around 9:00am, she went to spend eternity with Him. I have no doubt that my son was there to greet her. I can just hear the words leave her mouth of how proud she is of each one of us and the work that is being done. We are proud of her! She touched more lives in her obedient life than can be numbered. We will miss her intensely. Praise God that another of His precious ones has entered into His arms!